Looking for a fun, quick and useful gift. Or just a little something to brighten up a room. 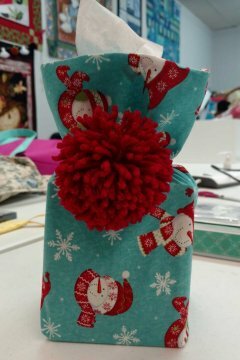 Have fun and make this quick and easy Tissue Box cover. Download pattern and instructions here. This Beach Chair Cover makes a wonderful gift for friends going on a beach vacation, hostess gift, and of course yourself! All you need: 2 Bath towels and 1 Hand towel. 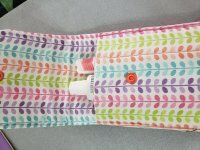 You can cover the hand towel pocket edge with fabric if desired. It is that time of year, summer! With that comes cool treats. Makes having a popsicle treat a little easier on little hands (and big ones too!). These quick and easy to make Popsicle Pockets with be a hit at your next summer function. You will be able to take our License plate, trim it up and create this cute zippered bag. Have fun choosing the Row by Row fabric and a colorful zipper. The finished size is approximately 7 1/4" x 6 1/2". You will be right in step while shopping during the Row by Row event. Everyone will be admiring your wonderful tote. For our Machine Embroiderers, we have digitized an In The Hoop zippered pouch that will stitch out in a 5" x 7" hoop. You will be able to take our License plate, trim it up and create this cute zippered bag. There are instructions included in the zip file. Our Machine Embroiderers will enjoy taking this In The Hoop zippered pouch with them during their Row by Row shopping trips. This cute zippered pouch will stitch out in a 5" x 7". There are instructions included in the Zip file. This wool caddy is a great place to store your wool and needles while working on your project. The handle slips over you arm and can be carried easily. Place on fold as indicated. Cut 2. Stitch right sides together, leaving an opening at the bottom of the lining. Turn right side out and overcast bottom and box corners. Enjoy! I'm sure that you know someone who would love this cute Cat Mug Rug. Cut 2 out of fabric. Cut 1 out of Warm and Natural. Layer Warm and Natural, 1 piece fabric right side up, 1 piece fabric right side down. Stitch 1/4" leaving an opening as indicated on the pattern. Using the Circular Sewing Attachment makes this project a breeze. This bowl is not just for the microwave, it is also great to hold a cold bowl of ice cream! Cut 2 13" squares of cotton fabric. How cute is this bag. I am sure there is a little one in your life that would love this. Cut 2 fabric pieces out of pattern. With right sides together stitch with 1/4" seam. Clip curves, turn and press. Casing: Cut 1 12 1/2" by 2 1/2"". Turn under ends to fit mouth opening. Press. Fold long side in half with wrong sides together. Press. Line up raw edges with raw edges of fish mouth and opening at the side seam. Stitch using 1/4". This is also a great serger project. We all have experienced a sore neck when we wake up from a nap in the car. Well, this could be the answer for you, your family and friends. This Pillow attaches to the across the chest seat belt strap. There is a pocket in the front that you can tuck your phone or other devices in. Now you can listen to music while resting with your Tech Media pillow. Great travel gift. Oral Care Kit. Need a quick hostess gift? 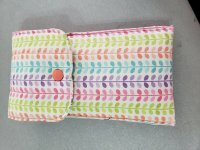 Let Kim walk you thru making a Tea towel Casserole Carrier. Let Kim walk you through making a KimberBell mug rug. Join Kim in as she shows you Fall and Winter Projects on YouTube.